If I had to make a projection, I would expect that solar panels will start performing worse in the future, while plants will start doing better. To understand why, first we have to note something interesting about how plants and solar panels use sunlight. In solar panels, we notice a linear dose-response relationship. As the amount of sunlight increases, the amount of electricity generated increases linearly too. A cloudless day may produce 100,000 lux, a cloudy day may produce just 10,000 lux. 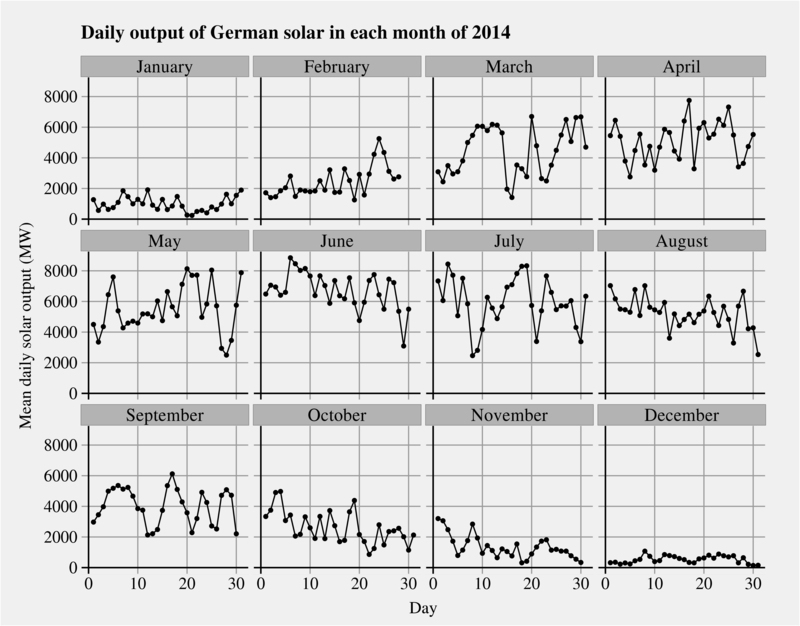 Hence we see huge variation in power generation per day in Germany. In plants on the other hand, we notice they become saturated at relatively low levels of light. A plant won’t fixate 10 times as many carbon atoms on a cloudless day as it would on a cloudy day. Responses vary per plant, but diminishing returns tend to set it rapidly above 10,000 lux. After a certain point, plants photosynthesis actually starts to drop, as the molecules used for photosynthesis are damaged. Important to note, is that plants ability to utilize low levels of sunlight improves drastically as carbon dioxide concentrations in the atmosphere increase, with the biggest increases seen at the lowest levels of sunlight. The question to ponder here is what happens to clouds as the climate changes, but there exists no strong consensus here yet. On the one hand it’s thought that plants will release less water to the lower atmosphere, thereby reducing cloud formation. On the other hand, plants regulate their local climate, to their own benefit. If temperatures increase, plants benefit from more clouds. It’s thought that the amount of volatile compounds that plants emit will increase, leading to enhanced cloud formation and thus reduced warming. There have been efforts to project what will happen to solar irradiation as the climate changes, but projections for the future on this subject per definition have a large margin of error. Still, the projections are not entirely reassuring. One estimate is that parts of Northern Europe will see a reduction in total generation capacity throughout the year of around 10% by 2100 under a business as usual scenario. The supplementary material gives further food for thought, as the biggest decrease in total capacity is seen in winter, where reductions of around 20% would be expected by 2100 under business as usual, in large areas of mainland Europe. For a solar energy based civilization, the capacity during winters would be the bottleneck. With the very tight energy margins a renewable civilization would have to cope with, such a reduction in output during winter due to a changing climate could have an important impact.